So back in June of last year I sold my TJ. Needed to pay off some bills. Well I'm back at it as of yesterday. Drove down to Newnan to pick it up. 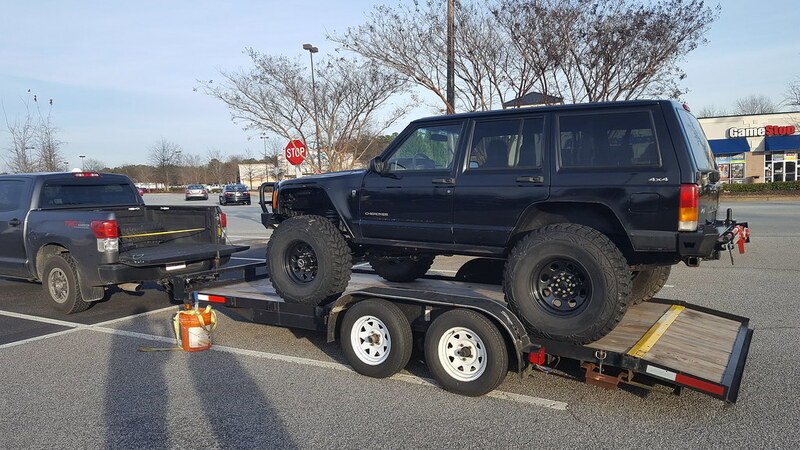 2001 Cherokee with a few things done to it. 66k MILES!!! The interior is a 10 out of 10. I was surprised to learn it also has electric windows, locks, mirrors and keyless entry! Glad to have the ability to have another off road toy. Hoping to join in on some rides this year. 4 Likes lt99ls1, tjsahara00, BigPrince and patman like this. really nice find, well done! Future plans are up in the air. Going to wheel it and see if it has any weaknesses, then go from there. Thought about getting rid of the ARB front bumper for something lighter, but uncertain so far. Need to repair the swing out tire carrier. Looks like it had water in the tubing and it froze busting the tube. My TJ had an Atlas transfer case in it, so pretty sure I'll be putting one in this. I loved that thing. I'll get some more pictures Friday. By the time I get off work, it's dark. My first concern would be the head. The '00 & '01 is notorious for head issues. To be 100% sure the head has been replaced you can remove the oil fill cap & look at the the head. It should have "TUPY" stamped in it. This thing has a vibration in it. Got it home last night and grabbed the yolk for the pinion on the rear diff. The thing moves around. Either the bearing is bad or the nut backed out of the pinion yolk. Guess I will be pulling that apart this week.